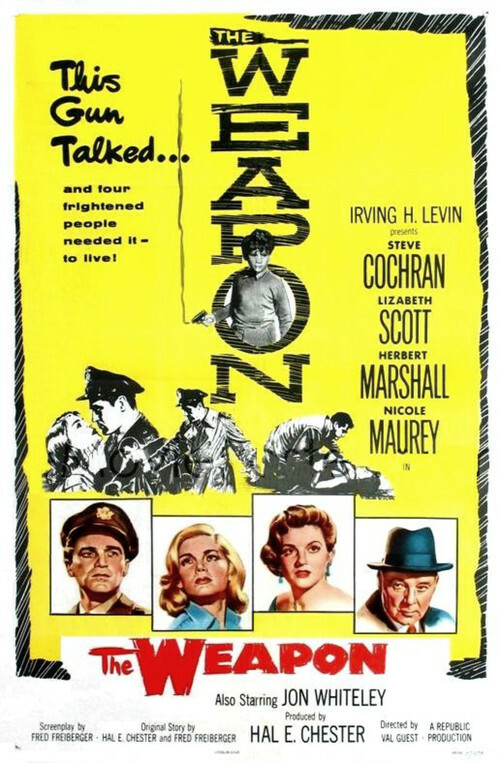 It’s hardly fair to compare the pre-exploitation exploitation flick “The Weapon” to the other films released in 1957, but a year that gave us such films as “The Bridge on the River Kwai”, “Paths of Glory”, “Witness for the Prosecution”, “12 Angry Men”, and “Nights of Cabiria”—to name but a few—but it helps me to remember that not all films from the waning days of the Hays Code-era were awful. Though the film is credited to Val Guest, who would go on to be a staple of Hammer Studios in the 60s and 70s, “The Weapon” is most assuredly a product of its producer and co-writer, Hal E. Chester. Chester reveled in schlock like the seemingly endless Joe Palooka series, at a time when some of the best films noir were being made. Some ten years on, he was still trying to dress up his pulpy premises in the guise of much better films than he was capable of making, and so it is with “The Weapon”. The film has a heck of a premise, one that certainly grabbed my attention when reading the synopsis, but like most low-budget films of the era, the dearth of major characters hurts any sense of mystery the film may be striving for. A ten-year old British boy named Erik (Jon Whiteley)—who bears an uncanny resemblance to Peter Ostrum, the original Charlie Bucket—finds a handgun in the ruins of a burned out, post-WWII building. After being razzed by some local roustabouts, Erik ends up shooting a particularly aggressive boy right in the heart—don’t worry, he lives, as does most everyone in the film who flirts with death. Erik runs off and hides, while a ballistics analysis of the bullet shows that it was fired by the same gun used in an unsolved murder ten years earlier. For reasons that are never explained in anything resembling a satisfactory manner, the case is turned over to American military officer stationed in Britain, Mark Andrews (Steve Cochran), who starts his investigation by trying to shake down the boy’s American mother Elsa (Lizbeth Scott). Of course he takes a shine to her, and the two set out to find the boy together, chasing down various leads, almost every one of which comes to a dead end. Meanwhile, Erik continues to elude capture thanks more to the sheer incompetence of the police force assigned to find him than any actual cunning on his part. And so the film goes in circles for the next 70 minutes or so, never building any tension thanks mostly to the fact that the obviously guilty party, nosy neighbor Joshua Henry (George Cole), pops into the film every few minutes to twirl his mustache and look suspicious. Though the film displays some of the more popular contrivances of the time, namely the overwhelming number of Americans running around England, it reeks most of the inglorious end of the studio who produced and distributed the film, Republic Pictures. Once a well-regarded hit factory in the 30s and 40s, by the mid-50s, Republic began churning out a series of indistinguishable noir-ish knockoffs, eventually succumbing to the monolithic power of television. Their inability to put out films that would get people out of their homes and into a movie house did them in, and “The Weapon” is a small but prime example of their downfall. It’s almost fitting that co-writer Fred Freiberger would go on to much greater success as a television writer, managing to escape the stigma of having written this film altogether. The performances are all curiously flat, with Cochran and Scott failing to make any sort of impression in the leading roles. They fall victim to their own melodramatic tendencies, and essentially demonstrate why they never managed to break through to the big time. Cole cuts an unintentionally hilarious villain, one that’s more memorable for how Snidely Whiplash-esque his performance is rather than possessing any true sense of menace, but he’s just about the only bright spot in the entire cast. The child actors in the film also flounder, often looking directly into the camera or rocking back and forth in frame. It provides a glimmer of entertainment, but certainly not one for which the director was aiming. Olive Films have truly gussied the film up on the recently released Blu-ray, and I imagine this is the best this particular film has ever looked. It does feel like a strange waste of resources to lavish such a slight and forgettable film with such a nice digital restoration. 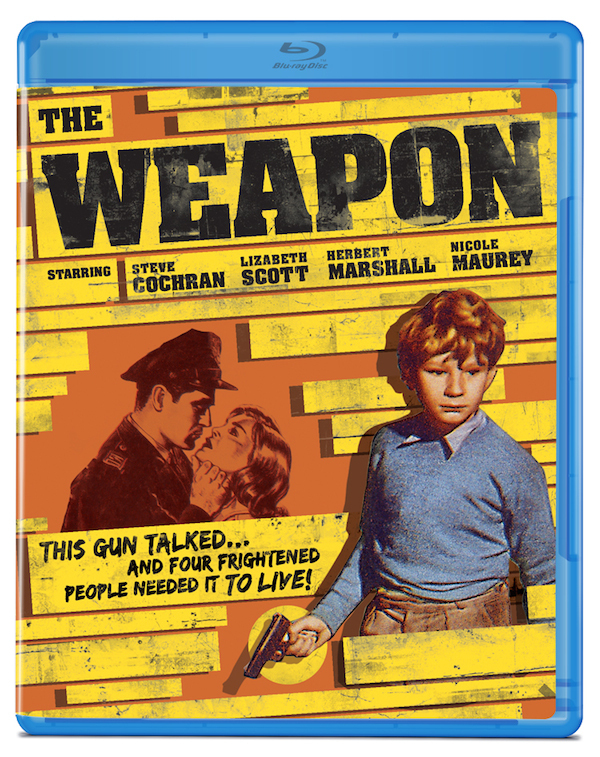 I can only recommend this film for genre completists, and would be hard-pressed to find anything more positive than that to say about “The Weapon”. Part of me is amazed that the guys over at “Mystery Science Theatre 3000” never got their hands on this, though fans of the show will enjoy providing their own MST3K style commentary to the film. Ultimately this is a film best left forgotten to the sands of time, much like the dreaded gun that sets the film’s events in motion.